Capable of either partial pressure operation or full atmosphere inert gas operation, using the combination of heating elements and a convection fan in the unit to heat the tubes in an efficient and uniform manner. Convection fan limited to 500o C operation (932o F). After initial pump down and backfill, full atmosphere inert gas operation. Capable of heating at the rate of 3.5o per minute to 5o per minute. Partial pressure operation with nitrogen or argon at approximately 1.2 to 1.3 Torr, up to a maximum of 10 Torr. Optional one-bar recirculating gas quench cooling. 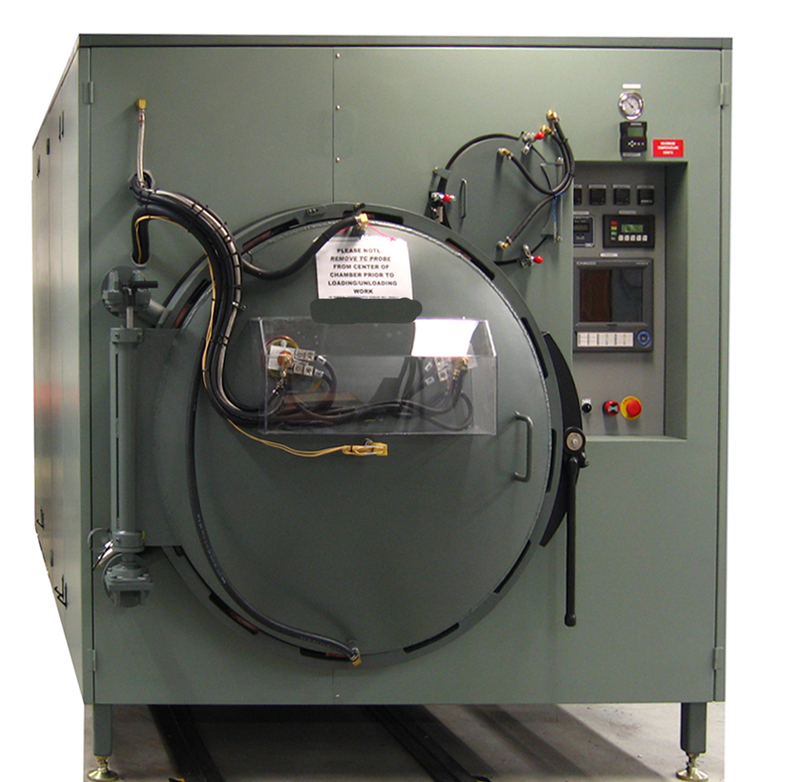 This is a totally enclosed, packaged, and assembled unit that is shipped as one piece, requiring only the water, gas, and power to be connected to the appropriate locations. Designed to simultaneously process up to four tubes measuring 7.5” diameter x 8.5’ long (19cm x 259 cm). The temperature controller will program cool the furnace using the natural cooling rate of the furnace from approximately 1200o C (2192o F) to approximately 700oC (1292o F), at which point the optional recirculating gas quench can backfill and rapidly cool the work. Remote diagnostics via a modem, enabling us to remotely aid in troubleshooting the furnace and guide your maintenance people directly. This should virtually eliminate the need for field service. 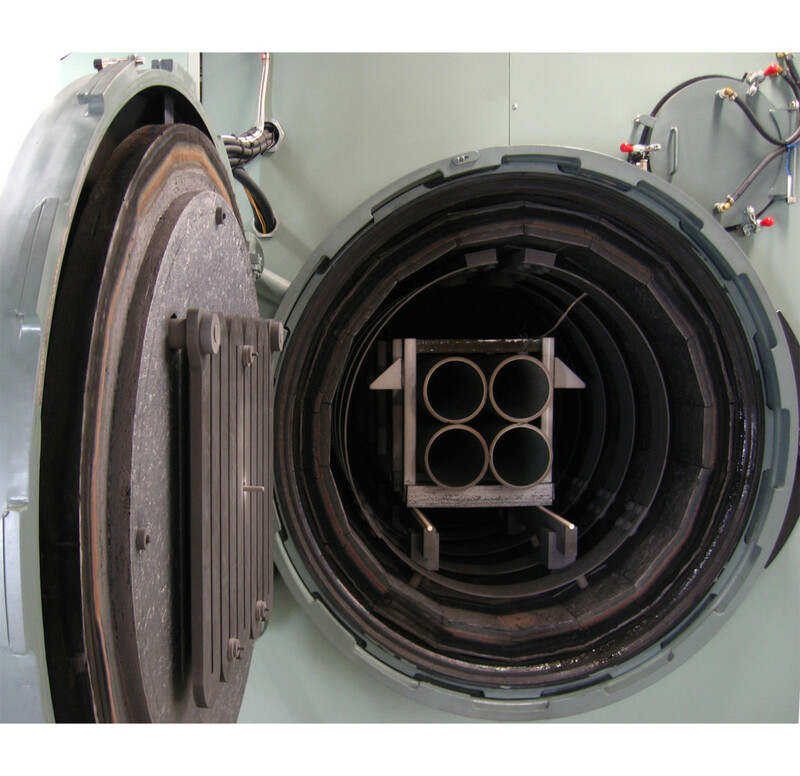 Mass flow control of the primary flow gas through the furnace. One-bar recirculating gas quench for rapid cooling. Work truck to load and unload the required fixturing to hold the tubes.